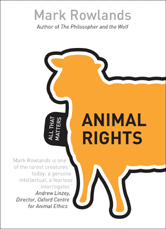 Mark Rowlands, author of The Philosopher and the Wolf, is one of the worldâs best known philosopher of animal rights. In Animal Rights: All That Matters, he explores specific issues of eating animals, experimentation, pets, hunting, zoos, predation and engineering animals. He ends with a challenging argument of how an improved understanding of animal ethics can and should affect one's choices. 3 What is it with aliens and their probes?